The unique locking mechanism just needs a tap on the end to open or lock the tongs, rather than needing a second hand to pull and push the lock. The silicone tips are safe for nonstick cookware and bakeware, and the tongs are heat-safe to 500 degrees. The tongs have a bend in the handle so the top of the tongs will sit upright on your counter. While it’s still possible that liquids can drip onto your counter, at least you’re not putting them on working end on the counter and then back into the food. Some users have noted that they’ve had issues with the locking mechanism, but Dreamfarm has addressed this by redesigning the lock and replacing tongs for customers who’ve had the problems. Any new tongs should be just fine. These are available with silicone parts in four different colors, to add a pop of color to your kitchen, and they are dishwasher safe for easy cleaning. A silicone head with a scalloped edge makes it easy to grab onto food firmly while also being safe for use with nonstick cookware and bakeware. These tongs are sturdy, you can lift heavy food (think a small chicken)) without worrying about bending or warping. These are heat safe to 600 degrees and have a nonslip handle and a comfortable thumb rest that make them ideal for prolonged use. They lock closed for storage and are dishwasher safe for easy cleaning. Sure you can use your cooking tongs for serving, but these scissors-style tongs can do it better. This is the style of tongs you’ll often see used in commercial kitchens or by caterers because the design just works, and they’re simple to use. These can also be used for cooking, when your other tongs are in the dishwasher. While the metal ends make them less desirable for nonstick cookware, they’re fine for use in your stainless steel pans. The handles are coated for a comfortable grip. These are dishwasher safe for easy cleaning. While silicone-tipped tongs are what you need for use in nonstick cookware, steel-tipped tongs can be very desirable when you’re dealing with foods that are a little slippery, since the metal edges can dig into the food and hold on tight. They’re also ideal when you’re cooking in a stainless steel pot or pan and you want to use the tongs to scrape the bottom of the pan. While silicone tipped tongs can handle high heat, you probably don’t want to use them when there’s an open flame, like when you’re cooking on a grill, charring peppers on a gas burner, or flambéing foods. 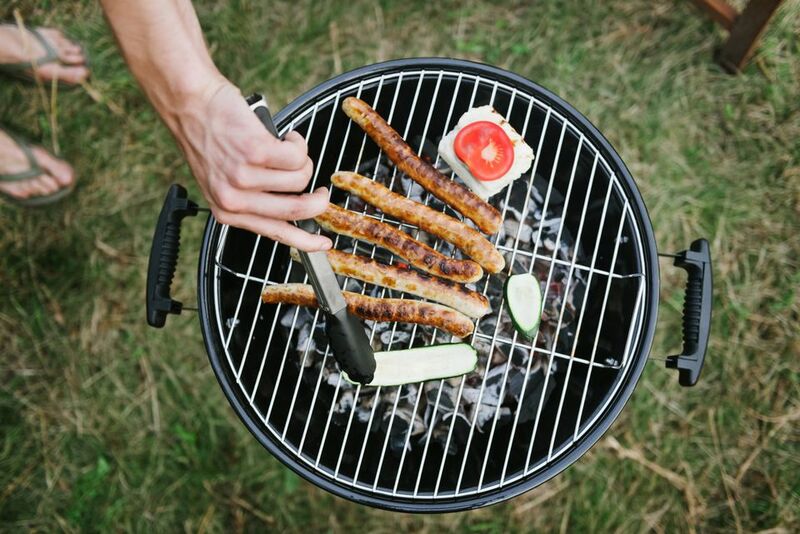 When you’re cooking on the grill, long tongs are ideal for keeping you further away from the heat, which is always a problem when you’re reaching for food on the far side of the grill. These 16" tongs have solid oak panels on the handles that stay cool and are comfortable to hold while you’re flipping sausages, vegetables and wings on the grill. Because of the wood, these should be washed by hand. When you’ve got a big bowl of salad on a buffet table or you’re passing it around for a big family dinner or holiday, wouldn’t it be nice to have a set of tongs that look attractive? These 18/8 stainless steel scissors-style tongs are much easier for anyone to use than separate salad-serving forks and spoons – you can even use them one-handed, so you can hold the bowl while you’re dishing up the greens. These will look good in any salad bowl, whether it’s wood, glass or ceramic. While they look elegant, they’re very affordable, so they’re great for everyday use for family meals, too. The metal won’t tarnish, stain, or corrode, even if you’re using them to serve an acidic panzanella salad or they’re left sitting in a lemony pasta salad on the buffet. If you prefer to hang utensils, you can hang them by their handles, or just store them in a drawer. These are dishwasher safe for easy cleaning. If tongs are your gadget of choice around the kitchen then getting a set of three might be a good idea so you'll always have a clean option handy. This set of three comes with a seven, nine, and 12" option all for a bargain price. Use the small tongs to flip omelettes while the larger one is great for flipping hot meats. With a silicone head these won't scratch your cookware and they have a locking end so storing is a breeze. When you're all done toss them in the dishwasher and they'll be ready for your next meal.